Zakia Soman is a founder member of Bharatiya Muslim Mahila Andolan, a mass organization of muslim women in India. She heads the Peace and Human Security theme in Action Aid. She is a member of Saape, South Asian Alliance for Poverty Eradication which engages with the issues of excluded communities regionally. She works and writes on issues of peace and justice, secularism, human rights, minority rights and rights of muslim women. 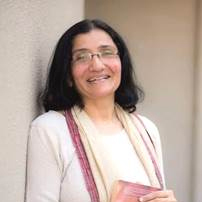 Her articles advocating rights of Muslim women and tolerance and harmony with other communities are published in various Indian publications. She has edited a book on dalit Muslims and a volume on peace and justice in South Asia. She has been a university lecturer and a newspaper editor in Ahmedabad where she belongs.